Flexible IR adopts a clear framework to identify tasks for automation. We track every TASK done during an Incident. This data helps to clearly identify what tasks needs to be automated. IACD recommends enterprises to Focus on identification and execution of high-reward / low regret response actions. Incident enrichment - Based on the artifacts available for the case, we programatically check with external service providers. For eg domain, url, IP address, File checked with virustotal. We also integrate with Cortex (Analyser part of theHive project) which has around 70 external analysers. Integration with internal systems for automated ticket creation/updation etc. API support being the key here for integration. Automated search of past cases - ELK integration where every case data with Indicators of compromise (IoC) gets into Elasticsearch. Integration with collection systems/agents that exist in the company(mainly application performance management - APM tools). Will help in quick information retrieval during IR handling. Automated approved remediation - Eg - If an anomaly detected by an end point device and a corresponding Incident raised in Flexible IR. Based on analysts decision Block the IP address by writing a firewall rule. This is purely based on the authentication to the Firewall and the APIs provided by the Firewall device. 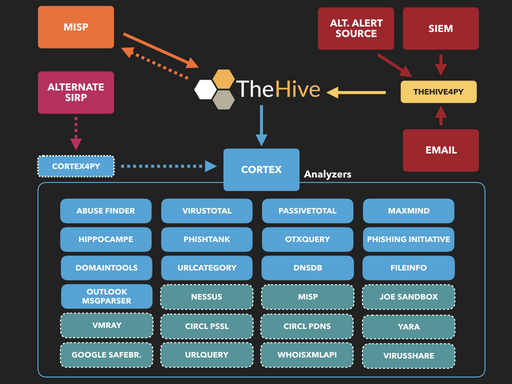 For Incident enrichment Flexible IR integrates with Cortex (Analyser part of TheHive project). Also integrated with MISP. In the above stack Flexible IR uses Cortex and MISP.